Georgia, a country in Western Asia bordered by Russia, Turkey, Armenia, Azerbaijan, and the Black Sea has a total land area of 26,911 square miles and a population of over 4.4 million. The deepest known cave in the world, the Voronya Cave (2140 m) is located in Georgia. Its geography has it all – from low lying plains to mountains blanketed in eternal snow and glaciers. Gold, silver, copper and iron along with hydro power are the main resources of the country. Given its diverse climate and topography, agriculture and tourism are the major economic sectors. 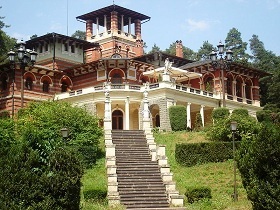 There are many tourist attractions and famous places in Georgia. The capital city Tbilisi has a number of attractions and activities. Because of its low altitude and diverse terrain, Georgia has a variety of animals. Georgian cuisine, like its landscape, is varied and choices abound in all categories of food. Georgia Bradt Travel Guide 978-1841622613 $11 Introductory travel information covering about 80 pages followed by region-wise coverage including Tbilisi, Shida Kartli, The Georgian Military Highway, Samtskhe-Javakheti, Imereti, Racha and Mingrelia, Svaneti, Adjara, Kakheti, and Kvemo Kartli. The first stamps of Georgia were a set of six stamps released in 1919 in the National Republic theme. The set (Scott #12 to #17) is remarkably inexpensive at around a dollar for Mint or used. The design shows St. George in a single color. Following the Russian Revolution of 1917, Georgia enjoyed a brief period of independence until the Red Army attacked Georgia and brought it under Soviet rule in 1922. A few other sets were issued during the interim along with handstamp surcharged overprints on Russian Stamps of the 1909 to 1918 time period. Chief among them was a set of five stamps released in 1922 showing local scenes. The set (Scott #26 to #30) catalogs for around $25 MNH or used. The designs show soldier with flag, peasant sowing grain, and industry and culture. Surcharged overprints on the same set were reissued in 1923. That set (Scott #36 to #40) catalogs in the same range. The most valuable stamps of Georgia during this period is a surcharge overprint on Armenia #141. That stamp (Scott #50) catalogs for around $200 mint and around $300 used . Georgia declared independence on April 9, 1991. The country went through a bloody civil war soon after and stabilized only after the election of Shevardnadze in 1995. The first stamps of Georgia after independence were a set of three stamps released on July 31, 1993 to mark the first anniversary of admission to the union. The set (Scott #73 to #75) catalogs for around $4 MNH or used. The design shows Georgia’s map, flag, and UN emblem. A set of five stamps and a souvenir sheet released on December 24, 1998 in the Locomotives theme. The set (Scott #193 to #198) catalogs for around $7 MNH or used. The designs show various locomotives built at Tbilisi Locomotives Works. A set of six stamps released on November 5, 2004 showing UNESCO World Heritage Sites. The set (Scott #356 to #361) catalogs for around $11 MNH or used. The designs show Ushguli, Bagrati, Gelati, Samtavro, Svetitskhoveli, and Jvari. Ushguli is a community of villages located at the head of the Enguri gorge in Upper Svaneti that contain buildings that are part of the UNSECO world heritage site of Upper Svaneti. Bagrati is a 11th century cathedral in the city of Kutaisi which along with the Gelati Monastery is a UNESCO world heritage site as a single entity. Samtavro is a 4th century Orthodox Church and Nunnery at St. Nino. Svetitskhoveli is an Orthodox Cathedral located in Mtskheta. Jvari is a 6th century orthodox monastery near Mtskheta. The first coins of Georgia were Russian Era Copper Coins denominated in Puli (half Kopek) issued in the late 18th century from the Tbilisi Mint. The issues continued through 1833. Many of these first issues are valued upwards of $100 for XF. Following independence in 1991, Standard Coinage (100 Thetri = 1 Lari) debut in 1993. The issues in Stainless Steel show a stylized candelabrum in Obverse and Denomination in Reverse. The first issues have very high mintage and catalogs well under a dollar for BU. Coins $1 and up UNCs from the 1990s starts around $1. Silver proofs starts around $50. Paper Money $3 and up UNC banknotes from the 1990s starts around $3. Rare varieties go into the 100s. Cloisonne enamel has been popular from the 7th century onwards and ancient pieces are sought after. Since Georgia was in the trade route, carpet, felt and silk are popular buys among visitors.